Classic style is transcended by our modern take on a vintage aesthetic! The ultra-soft and luxurious lightweight Tri-blend material feels so good, you may never take it off. This special blend of 4.2 oz, 32 singles, ringspun cotton, polyester and rayon has become a favorite for it's superior comfort and breathability. Looking good = shooting good. In this tee, you're sure to do both! 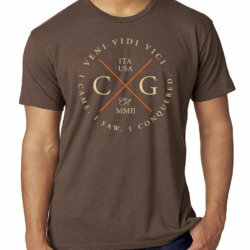 Front graphic contains our iconic “Veni Vidi Vici” mantra with English translation below. “I came. I saw. 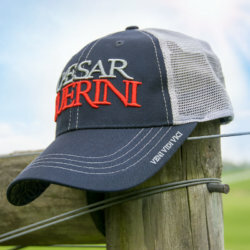 I conquered.” Back features a Caesar Guerini logo print down the center spine for a modern look that is sure to turn heads. Available in Military Green or Macchiato.